“People go through their entire lives without having a co-worker as good as Sherida – much less a boss,” said Dan Membiela, coordinator of student records at WMU-Cooley Law School. Sherida Wysocki recently retired from a 30-year career as Registrar and Assistant Dean at WMU-Cooley. Ask anyone at the school about their favorite memory of Sherida and you get a brief silence as their brain locks up from the multitude of accolades colliding to gain voice at the same time. “She was an incredible worker,” Membiela recalled. With a quick smile, endless patience, and a legendary sense of humor, Wysocki made loyal lifelong friends, solved complex problems with aplomb on a daily basis, and inspired students and colleagues alike to do their best. 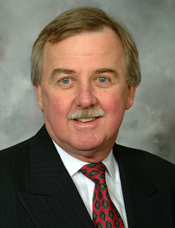 Wysocki became the Registrar at WMU-Cooley on April 30, 1984. In 1999, she was made an Assistant Dean. She says she never really thought about the longevity of her tenure with WMU-Cooley. “If you enjoy what you’re doing and like the people, it’s a daily part of who you are. It’s your family,” she explained. She shepherded her department through some monumental changes, staffing the office with student-focused professionals, weighing in on the office design when the Cooley Center opened to maximize efficiency, and overseeing the move to online registration. Unflappable as always, Wysocki had a go-with-the-flow approach to the various office changes. She was always more focused on the students and met with them on nearly a daily basis. Until a few years ago, Wysocki did all the academic counseling for students, and she worked closely with students going through some significant challenges. “My greatest accomplishment was being able to help the students,” Wysocki recalled. “You can make a difference in someone’s life.” She saw many progressions of struggle, adjustment, and success. She treasures the emails she received from students letting her know they had made it through a hurdle, or notes sharing that they’d made the Dean’s List, and more. Wysocki’s own sense of humor was the reason Membiela joined Cooley rather than another school he was interviewing with at the same time. “Sherida laughed, and had me laughing through the entire interview,” Membiela recalled. Wysocki is reveling in her new retired lifestyle where she can make the artistic endeavors she’s pursued over the years into the primary focus of her day. 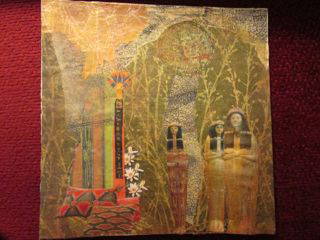 Already known for her jewelry work, Wysocki has more recently immersed herself in glass work, mixed media, batik, watercolors, collage work, and more. 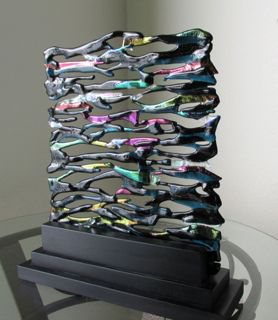 Her first glasswork was accepted into a juried show, displayed in a place of prominence in the gallery, and sold, in the term before she retired. The cake at Sherida Wysocki’s retirement party. Now wintering in Florida, Wysocki has signed up for art workshops, discovered the artsy area in St. Pete, and is actively pursuing art. She identifies herself as an artist now and is excited about what the future holds for her in this new arena. “Ultimately, my dream is to have a place where I can have my own studio/workshop.” There she can pursue her passions in jewelry, collage work, mixed media, and glass work, and get a kiln and explore that medium as well. See us on the web at wmich.edu/law. Xiomara Rivera is no stranger to seeing new places. She’s traveled extensively as a member of the military and has seen nearly every part of the world. Yet there was one place she hadn’t visited. The South Pacific. A destination that topped her Bucket list. 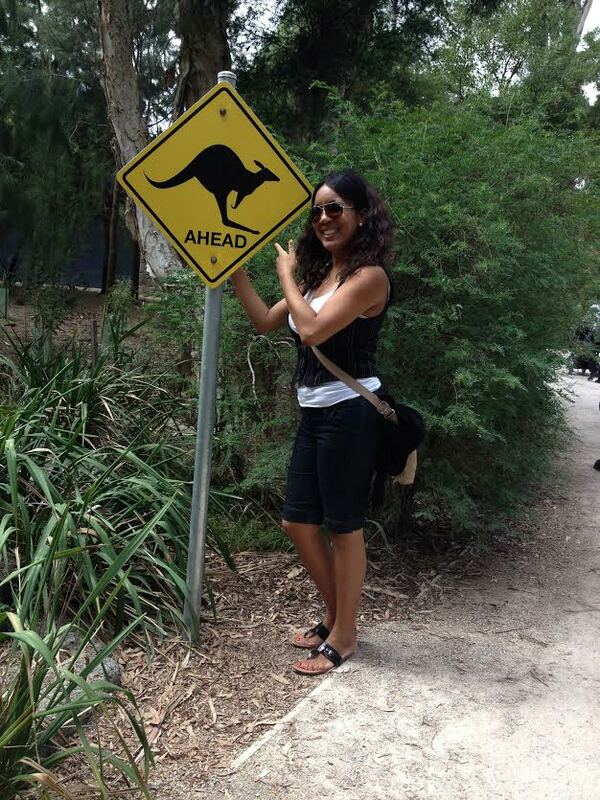 Xiomara Rivera didn’t have any problem finding kangaroos in Australia with this kind of signage! As a law student, she didn’t think she could consider or have the time to travel. That is until she heard about WMU-Cooley’s Foreign Study program Down Under. The chance to visit and study the law in the South Pacific was calling her – and she answered quickly – signing up for WMU-Cooley’s Australia/New Zealand Winter 2014 program. Bonus: January Down Under is their summer! Visiting Australia and New Zealand, along with side trips to Indonesia and Tahiti, was a dream come true for Xiomara – making it on another list – The South Pacific is one of her favorite places in the world! Greg Coleman, partner at Critton, Luttier, and Coleman, a law firm in West Palm Beach, Florida, and current President of the Florida Bar was interviewed by WMU-Cooley Law Review member Jerrod Simpson. President Coleman talks about technology, the bar exam, diversity, access to justice, and ethics. Download the condensed text of the interview. Western Michigan University Cooley Law School’s President and Dean, Don LeDuc, publishes commentaries on our website about the Law School, legal education, legal employment, and related topics. This post summarizes President LeDuc’s commentary in which he takes on those who misuse — and abuse — the LSAT. Commentators, including academics who should know better, are improperly using the Law School Admissions Test to justify assertions regarding the quality of potential law students and the law schools they consider, contrary to published limitations on the proper use of the LSAT by the Law School Admissions Council, which creates and administers it. The LSAC says that “[t]he LSAT was designed to serve admissions functions only. It has not been validated for any other purpose.” Using the LSAT to make judgments about the capability of an individual—or a group of individuals like a law school’s entering class—to pass a bar examination is a misuse of the LSAT. The LSAC has declared that the LSAT has not been validated as a predictor of future bar results. Bad as that claim is, the assertion that a low LSAT score foretells incapacity to practice law is even worse. Again, the LSAT has not been validated in that regard. Nor has anyone been able to define what is or is not the capacity to practice law, much less measure who is likely to practice it well. Any claim that the LSAT does so should be completely disregarded, if not derided. The LSAT cannot be used as the sole criterion for admission to law school. The LSAT is not the best predictive measure for law school success. The LSAC tells us that the LSAT is intended to “assist in assuring that there is a demonstrated relationship between quantitative data used in the selection process and actual performance [at a particular school].” But the LSAC’s own correlation studies invariably find that neither the LSAT score alone nor the UGPA alone are better predictors than the use of those two factors combined in the context of previous levels of academic success at that institution. Indeed, what the LSAT does is attempt to predict the likely first-year grade point average for the person being considered for admission to the particular school, based on how well those previously admitted with the same combination of the two factors did. There is no bright line LSAT score below which a school should not offer admission. The LSAC declares that “[c]ut-off LSAT scores (below which no applicants will be considered) are strongly discouraged. Such boundaries should be used only if the choice of a particular cut-off is based on a carefully considered and formulated rationale that is supported by empirical data . . . .” Cut-off scores may have a greater adverse impact upon applications from minority groups than upon the general applicant population. Those who claim that the LSAT score bears any relationship to the ability to practice law are ignorant at best. The assertion that LSAT scores predict bar results is without support. Those who create and provide the test have stated that a correlation of LSAT scores to the passage of a bar examination has never been validated, certainly not by them. One reason that a valid connection is not possible is that there is no such thing as “the bar examination.” Each state administers, scores and weighs its own examination in such a way that a person with identical LSAT scores and multi-state scores could pass in one state and fail in another. Rankings and ratings based on LSAT scores are flawed. Unfortunately, we are fascinated with labeling and ranking. We rank schools based on LSAT scores, we rank schools based on bar results, and we characterize law schools by tiers and students by LSAT scores. We assert that students with LSAT scores below a certain number are inferior and unworthy, but fail to take into consideration that the creators of the LSAT affirmatively declare that such a conclusion is not valid and is an improper use of the LSAT score. We assert that the LSAT test measures the ability to practice law, again contrary to the proper use of the LSAT and again despite the fact that there is no evidence to substantiate the claim. We disregard that minority groups are arguably adversely affected by multiple-choice tests. In the land of opportunity, those who would deny anyone who has graduated from college the opportunity to fulfill a dream based on an LSAT cut-off score are elitist, paternalistic, and ignorant of the purpose of the very test they rely upon as the basis for their denial. Law school applicants and law schools deserve better treatment. Read this commentary in full. See us on the web at wmich,edu/law. 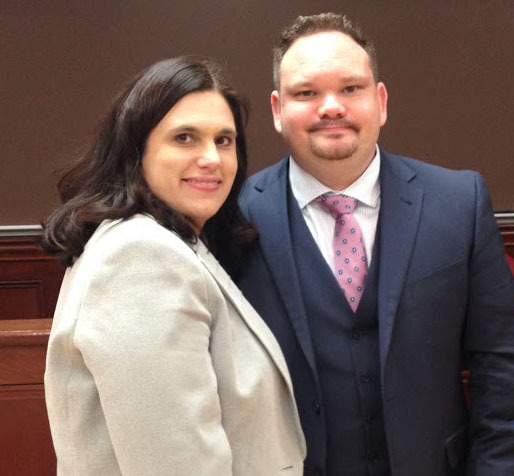 WMU-Cooley law students and couple Elizabeth and Bryan Devolder were named the top team in the 2015 ABA Client Counseling Competition in February. “Who needs just red roses and dark chocolate when what I really love is working together and solving problems with my husband as a team,” exclaimed Elizabeth Devolder about the couple’s Valentine win in the ABA Client Counseling Regional Competition in Pittsburgh, Pennsylvania on Feb. 8th. The WMU-Cooley Tampa Bay campus evening students Elizabeth and Bryan Devolder were crowned regional champions and now advance to the national competition held in North Carolina in March, where 12 teams — the top school in each region — will compete for the national title. WMU-Cooley Associate Dean and Coach Chris Church was impressed with the couple’s problem solving skills in the competition, and loved the pair’s style and chemistry. The national topic was family law. The Devolders began their interview by revealing that they were a married couple, and talked about the advantages of gaining both a male and female perspective. They had framed pictures of their two children on the desk, completing the family theme. This is the 7th win in 10 years for WMU-Cooley teams at the hotly contested Client Counseling Regional Competition. Our 2011 team of Erin Moss and LaToya Palmer won the ABA national championship. This year, WMU-Cooley team Devolder beat over 11 teams to win the regional competition, including teams from the University of Michigan, the University of Pittsburgh, the University of Akron, the University of Louisville, Duquesne University, and Northern Kentucky University. Breitfeld, an assistant professor at WMU-Cooley’s Auburn Hills, Mich., campus, was understandably surprised. At WMU-Cooley’s recent commencement ceremony, the young faculty member became the first-ever Research and Writing professor to win the school’s coveted Stanley E. Beattie Award for Excellence in Teaching. At the same time, she also became the first-ever faculty member from the Auburn Hills campus to win the award. Fellow professor Tammy Asher whispered back, “Yes, you have to do something. You have to make a speech!” Asher, who Breitfeld views as her mentor, said she could see Breitfeld absorb the shock and adjust on the spot. “This calm comes over her and she gives this amazing speech,” Asher said. Breitfeld joined the full-time faculty at WMU-Cooley in 2011. She teaches Research and Writing, as well as Advanced Writing. Both subjects feature small classroom populations and a heavy emphasis on professorial critiques of students’ writing projects. It’s hard to get a lot of “warm fuzzies” in that kind of setting to win a favorite teacher award that is voted on by members of the graduating class. But Breitfeld transcended that difficult dynamic to break through the barriers and win the award. How did she do it? A visit to Breitfeld’s office tells part of the story. Liberally decorated with personal memorabilia, including photos from Breitfeld’s recent wedding, the office is the professor’s home away from home. She’s there often and her door is always open to visitors. Whether they need to talk about a sticky problem with class material or something more personal, students have quickly learned they will find a willing listener in Breitfeld. A chat with Breitfeld tells more of the tale. She is comfortable sharing her non-faculty life with others. She often uses real-life examples from her years as an assistant prosecutor in Macomb County, Mich., and doesn’t hesitate to share stories of challenges both in the courtroom and when she was a student. For Breitfeld, the honor is not the unusual-looking statue, but what the award means in terms of support. Breitfeld was able to share her fantastic news with her husband in a post-graduation phone call, and with her family at an already planned dinner on that same Sunday. Then she was back in action, answering emails at all hours, meeting with students in both planned and impromptu meetings, guiding students in the classroom, and reveling in a career where she feels truly welcome.